Toronto artist, producer and mezzo-soprano, Ali Garrison, has teamed up with her American colleague, Dr. 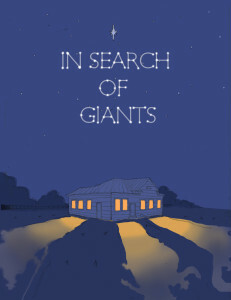 Von H. Washington, Sr., a renowned theatre professional for forty years, to bring their well-received theatre presentation, In Search of Giants to Windsor, Ontario for Culture Days. This production, about a personal journey leading to the discovery of three significant leaders on the Underground Railroad, has been playing to full houses and standing ovations since it began touring Michigan in November 2015. There have been numerous transnational performances since, along Michigan and Ontario Underground Railroad routes, including Schoolcraft, Kalamazoo, Albion, Ypsilanti, Ann Arbor and Toronto. Next on its Freedom-Seeking Tour, In Search of Giants comes to Culture Days in Old Sandwich Town (now part of Windsor), Ontario, at the old courthouse, MacKenzie Hall Cultural Centre on October 1st, 2016. This important village along the Detroit River was where so many refugees from slavery settled, including one of our most significant Giants, the great Abolitionist, Henry Bibb. For more information and bookings in Canada contact Ali through this website.